Ascendant, the manufacturing arm of Facelift and ‘British’ manufacturer of self-drive access platforms has seen a huge surge in orders. The 12.5m 3.5t van mounted lift being the most popular, along with the A22-17TJ 22m machine. Enquiries are coming from all sections of the market, although these products are especially popular with roof management and street lighting companies. 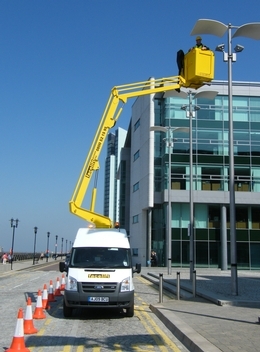 Chambers Southern Ltd who have purchased the Ascendant A22-17TJ needed a 7.5t self-drive machine with great outreach and cage capacity commented: “We maintain the lighting on our motorway networks and we needed not just great height but the best outreach. The 22m Ascendant is a market leader and very competitively priced. N R Hardy & Co who purchased the 3.5t 12.5m van mounted platform added: “I had been thinking of purchasing a 12m van mounted lift for some time. After asking colleagues in the industry what they thought the Ascendant was highly recommended. I tested one that had been purchased by a friend and I knew immediately it was the right machine for the job.